Recently while browsing a book store, I stumbled upon this book with a weird name which immediately attracted my attention. The subject seemed interesting and relevant, and I ended up buying the book then and there. 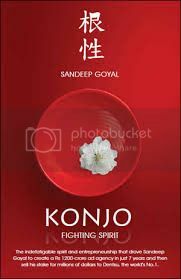 Konjo, which in Japanese means – “The Fighting Spirit”, is the story of Dentsu’s entry into India and is written by Sandeep Goyal, the person who got Dentsu to India. The book is in a chronicle format detailing the author’s life from the point where he quit Zee, to heading and making Dentsu a formidable advertising Agency in the Indian Industry. Goyal is not one to forgive, and at no point does he mince words or not mention names. He is brutal and honest in recalling incidents. Like the time where he mentions wanting to slap the CEO of a prominent agency, or accusing an insurance firm of using a tag line created by his agency much after their association was cut. He is honest to the point of embarrassment. At the same time, it is not a “unleash my grudge” kind of book, and the author details out the entire ardous journey of him convincing the Japanese of why he is the most suited person to mantle Dentsu in India. The process of setting up a winning team, and the many snippets and anecdotes of various pitches and campaigns during the crazy years in Dentsu makes this book an interesting read. it provides a good insight on the ways of working of the Japanese, and the subtle cross cultural differences that need to be kept in mind during interaction with them. It also has some hilarious short anecdotes like the one where Sandeep was regarded as a very rich person in Japan Dentsu office as he had served Mangoes to his Japanese guests during Dinner. Or the incident where the entire Dentsu mechanism got into chaos looking for a missing Japanese employee, who was later found to have locked himself up in his room watching TV! After selling his partnership back to Dentsu, and making a lot of money in the process, Sandeep is now left with enough free time to pursue his many interests. He is now writing a PhD thesis on “Human Brands”, is involved with a food channel and dabbles in other interesting stuff. After reading the book, I am now curious to read his other book – “The Dum Dum Bullet”. A must for someone curious about the Indian Advertising Industry.